First, allow me to clarify some insights. When a graphic practitioner performs a recording or graphic transcription, capturing key ideas or conversations is the primary role, thus the term recorder. When a practitioner expands their recording to include the non-verbal or textural communication, then the process goes from recording to translation. Converting one form of language into another. Visual translators perform a similar function like that of a sign language interpreter who stands at the edge of a stage and signs what is spoken or written. Yet, they must also include the emotion and inclination of the speaker to help communicate the meaning of what is expressed. This action is as much an art as a science. Unlike sign language, visual translation can achieve another level given the proper training and detective skills. The act of investigation is part observation and part reflection. As visual translators trained to be listeners, an opportunity to uncover gaps in conversations and discover what could be an underlying issue adds a bit more dimension to the recording. These unspoken issues can be included into a graphic note or sketchnote to add more impact, increase clarity and add greater insights. By taken the next step beyond merely recording and translation, a recorder can increase the value of the output. Caution must be taken as not to jump ahead of the process and make a presumption of direction or assumption of issues. Only by reflecting on the whole of the event and recording can the investigation be performed. 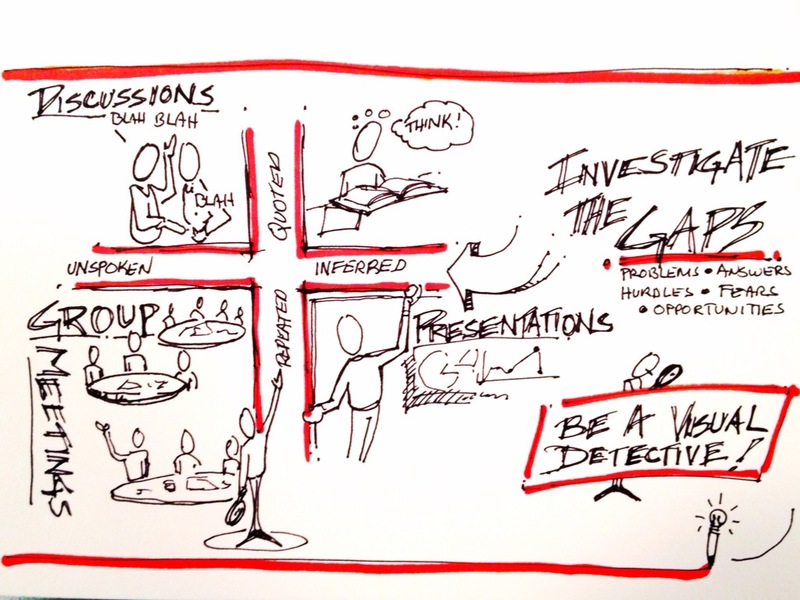 It may not be elementary to be a Sketchnote Sherlock and may not be an applicable in every case, but in meetings and strategic planning sessions, it can be extremely helpful when needing to shine some light on the issue and help solve a mystery of stagnation or hesitation. so add another tool to your pack, a graphic spyglass and increase the value of your services.